In a devotional I read this morning by an author named Max Lucado, he describes a Portuguese word “garra” which means claws. A person with garra has claws that burrow into the side of the cliff and keeps you from falling. His interpretation is that if you hang in there until the end…if you go the distance, you will come out on top and you will be saved. I, like a lot of other people in the world, have been facing a lot of uncertainty with the instability of the economy and job market. I find myself burrowing into the side of the cliff to prevent myself from falling. There are a lot of people out there on that cliff with me at this very moment. 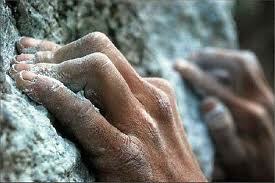 Every person has their own set of personal challenges and cliffhangers. If we, each and every one of us, keep digging our claws into the rock of God and just keep hanging on, I know He’ll make sure we get to where we’re supposed to be.